The legend (or legends) behind one of the oddest vegetable plots in the state. At the top of this boulder lies an unusual garden, which was first planted in the 1700s and is maintained to this day. 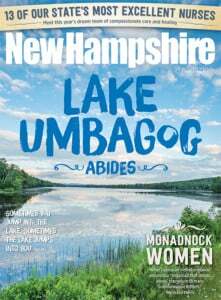 Situated on the banks of the Wild Ammonoosuc River in the town of Bath, there’s an unusual vegetable garden with a sweet story. What’s so unusual about a garden? Well, this one is located on the top of a large boulder. A homemade ladder of two-by-fours is conveniently leaned against this great rock so that the curious can climb the 8 feet, more or less, and gain access to the top of the rock. Though the top is too small for a typical vegetable garden (it measures only about 6-feet-by-10-feet), every season it gets cultivated and planted anyway with pumpkins, cucumbers and corn. As the vegetables take root and grow, the gardener must weed and water and work from the ladder as there becomes less and less room on the top of the great rock for both the plants and the gardener. The garden is called Mercy’s Garden, and its legend is kept alive each year by a handful of volunteers who continue the tradition of planting a few crops on top the big rock, receiving little or no vegetables in return for their labors. The legend of Mercy’s Garden begins in 1766, when Jaasiel Harriman settled near a small Indian village on the banks of the Wild Ammonoosuc. Single men had come before him, but Harriman was the very first settler in Bath who had a family. He brought with him his wife, a 9-year-old daughter named Mercy and two (or perhaps three) other younger children. Life was hard those first years. Harriman had to chop down trees, cut them into logs and build a cabin that would shelter them through the tough winters. His wife was pregnant, and in December of 1766 gave birth to another daughter, named Mary, who was the first white child born in Bath. Harriman also had an obligation to the proprietors of the town to clear and cultivate a certain number of acres each year in order to keep his land grant. Harriman was kept busy building a home, hunting for food, clearing the land, cutting firewood and tending to his few farm animals. Marauding wolves and bears bothered his stock and scared his family. Indians were a constant worry. Fort at No. 4 in Charlestown was the closest place to obtain emergency aid, provisions and other necessities that the family needed. The trek to and from the fort took several days, and Harriman was forced to leave his young family alone while he was off obtaining these provisions. On more than one occasion, the Indians seeing him leave would enter his cabin and help themselves to whatever they wanted while his wife and children hid and watched, helpless and terrified. The book of Bath history, “Address Delivered to the Inhabitants of Bath on the Evening of January 23, 1854,” written by Rev. David Sutherland and Rev. Thomas Boutelle and published in 1855, tells a brief story about Mrs. Harriman that demonstrates her mettle and tenacity while her husband was away: “On one occasion, Mrs. Harriman being out of doors, perceived something coming across the island directly towards her. She ran down to the river and found it was a young moose panting and much exhausted by running, which was then swimming across the east branch of the Ammonoosuc. As soon as it reached the bank, she seized it and held it fast, til her little daughter had brought her a knife with which she cut its throat. Very soon some Indian hunters, who had been pursuing it, made their appearance. Finding it dead, they skinned it and gave her one of the quarters which weighed near fifty pounds and which she carried to her home for provisions for her family until her husband returned.” Life was harsh for the family in their new frontier home, the work was physically demanding, conditions were dangerous, and survival was tenuous at best. Life for the children was lonely, and there were few opportunities for childhood friends or play. Gardeners must tend the plot from the ladder as there isn’t exactly an abundance of space. Perhaps it was nothing more than a lonely 9-year-old girl playing in the dirt, and perhaps it was done with forethought as a means of survival. But for reasons known only to her, one day Mercy Harriman filled her apron with dirt and climbed to the top of the great rock located on her father’s land. She then made many repeat trips up and down the rock, and back and forth to the riverbank for the rich soil that she carried in her apron back to the top of the boulder. When she felt she had enough dirt packed in place on top of the boulder, she planted corn, cucumbers and pumpkins, and started the first garden in Bath. Some versions of the legend say that Mercy planted her garden on top of the rock as a way to prevent woodchucks, deer, rabbits, moose and other pests from getting into and nibbling on her garden. Other versions suggest that her boulder-top garden was meant to hide the food from the Indians that passed by and helped themselves to their vegetables. Still another version suggests that Mercy’s Garden was used, at least in part, to satisfy her father’s requirement that he cultivate some minimum amount of acreage. Others have speculated that the top of this rock was her secret hiding place, and the garden was her childhood play area similar to any kid that has ever made mud pies, built sand castles or dug a hole to get to China. As with any good legend, there are differing versions and the exact truth will likely never be known. The Harriman family lasted only two years in Bath. The death of one of their young children and the constant fear of an Indian attack was enough for them to give up their claim and move south to Chester. Mercy is said to have married a man from Corinth, Vermont, where she died in 1847 at the age of 89. But Mercy’s Garden has lived on. The Daughters of the American Revolution affixed a bronze plaque to the side of the great rock, and up until 1928 they maintained the garden. The local Grange took over after the D.A.R. ceased, and for many years volunteer abutting land owners and Grange members made sure that the tradition of Mercy’s Garden continued. If you ever get the opportunity, stop by and follow the rustic hand-lettered signs pointing down the garden path to a doghouse-looking structure on a post beside the great rock. “Please Sign Our Book,” reads the sign on the door of this structure, which refers to the book tucked away inside. The entry in the book for June 6, 2006, reads: “Today I planted Mercy’s Garden with corn, pumpkins and cucumbers. Two hundred and thirty-nine years of maintaining a child’s fantasy, and a sweet story.” Yes, it is.